"Seventy-five-year-old John Perry joins the Colonial Defense Force because he has nothing to keep him on Earth. Suddenly installed in a better-than-new young body, he begins developing loyalty toward his comrades in arms as they battle aliens for habitable planets in a crowded galaxy. As bloody combat experiences pile up, Perry begins wondering whether the slaughter is justified; in short, is being a warrior really a good thing, let alone being human? The definition of "human" keeps expanding as Perry is pushed through a series of mind-stretching revelations." There’s a saying about war that gets floated around a lot, something about how it’s made up of long periods of boredom interrupted by short periods of terror. So it’s probably fitting then that the pacing of Old Man’s War seemed to stretch and contract in much the same way. Not that the book was ever boring, mind you. 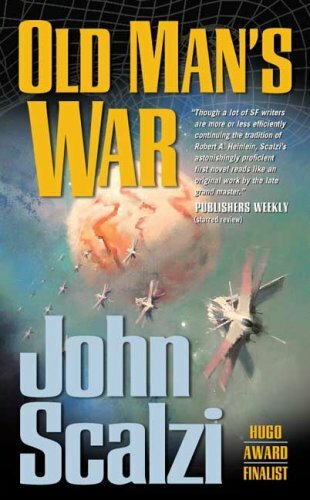 Scalzi does an excellent job of keeping the reader interested, his prose is so clear and lively it practically reads itself. But sometimes it took several chapters to cover a few weeks, and then suddenly months were gone in the space of a few sentences. Chapters were devoted to Perry's first few days off earth, but barely a quarter of that to his first alien encounter, for example. Was this a bad thing? Perhaps not. The lack of pages devoted to all the battles and such Perry was involved in made it seem as though they were insignificant, or at least not noteworthy enough to devote the same level of attention that Perry’s first few wonder filled days in space received. One of the main debates that runs through the book is whether or not the powers that be wage war too lightly, and the way numerous battles zip by support this idea. Still, I think I would have liked to novel to have been a bit longer. It never felt rushed, exactly, but the quick pace did hinder my ability to really connect with any of the characters outside of Perry. This works against Scalzi, because he tries to pull off what I like to think of as the “Harry Potter Heartbreak” technique. Think back to last Harry Potter book, if you’ve read it (and if not maybe skip a few lines here…) In the final epic battle of epic battley-ness a number of characters die. It happens without fuss, often offscreen, and in a few cases I didn’t even realise such and such was dead until I read closer. At first it made me furious, not because they had died but because their deaths were treated so carelessly. But then I came to realise that it was a comment on how careless war is of life and etc. Because I loved those character so much their offhandedly mentioned deaths gutted me, but also made me really consider what war is. I think Scalzi was going for the same feeling. Characters die left and right in this book, sometimes heroically, sometimes absurdly and sometimes for no reason. But the problem is Scalzi hasn’t given you a chance to really connect with any of them, so each death is met with a shrug. It lacks any kind of emotional punch and is therefore not that effective. Of course, no matter how many characters get eaten by killer mould or decapitated, there is never any doubt that Perry will be fine. Not because the book is told in the first person, but because Perry is kinda perfect. He solves problems before anyone else, he survives when no one else does, and saves lives when no one else could, he gets promoted like every second page and everyone likes him. He forces grudging smiles from the hardest men, and even though all the green bodied newly young people are physically beautiful, (this is actually very well explained) it is the mostest beautifullest one that wants to bone Perry. He’s one pet lion away from being Ayla from Clan of the Cave Bears. But still, despite these complaints, Old Man’s War is incredibly easy and fun to read. The prose is clear, and the speculative concepts Scalzi introduces are so easy to grasp that you don’t first realise how complicated these ideas really are. If I read the next part’s of this series (and I suspect I will) it will be to see these ideas and the universe(s) Scalzi houses them in explored more fully, but it wont be for the characters. And that’s what makes this a book I liked instead of a book I really liked. For me characters are the most important thing in a book, and it’s the area where it seems Scalzi is weakest. But if you don’t place as much importance on characters as I do then you’ll probably love this book a hell of a lot more than I did.